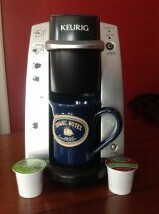 Amenity Upgrade: Introducing Towne Motel’s New In-Room Keurig Coffee Makers! Here at Towne Motel, we’re pleased to introduce our first amenity upgrade: in-room Keurig coffee makers with Green Mountain coffee K-cups. We love coffee. Actually, we need coffee. Siobhan should not be approached before her first cup in the morning. Katja drinks it through the day and (European-style) has been known to enjoy a cup at midnight. When our previous coffeemaker broke down forever, we ran out and bought a replacement the same day. The morning after Hurricane Sandy blew through and took the power supply with her (we were at the Jersey Shore then) our first question was, how will we make coffee??? On Morning One we heated leftover brew on the gas grill, then discovered that our gas stove still worked (hooray!) and moved to a boiling-water + filter system. Only later did we think of things like where we would buy more flashlights or how we would keep the house warm in late October-early November temperatures. b) we want/need coffee at other times in the day! And Keurig coffee makers were clearly the way to go. A recent blog post,“Why Are So Many Hotels So Cheap When It Comes to In-Room Coffee?” (Hotel Chatter, Oct 15, 2013) complains about the surprising number of hotels that still have cheap-o (we won’t mention a brand) coffee makers in their rooms. Like the ones that make you use a paper filter and then give you a bad, weak cup of “coffee” for all your trouble. If you’re going to do something, we figure, do it right. So Towne Motel joins the ranks of many fine inns and hotel chains (like Hilton Garden Inns this fall) featuring in-room Keurig machines. We chose—after much research by Katja–the very popular Green Mountain K-cups, and we boosted the to-go cups, too. The new ones have the better, actually drinkable-from lid tops, not the kind you have to struggle to peel off and then burn your fingers on. It’s our way to celebrate the New Year at Towne Motel, with a gift that will keep on giving! This entry was posted on Tuesday, January 7th, 2014 at 5:50 pm and is filed under New Amenity. You can follow any responses to this entry through the RSS 2.0 feed. Both comments and pings are currently closed.